Is it just me or do any of you keep tabs open on some sort of device FOREVER just to remind yourself you need to make something? Which means one thing...I'll sometimes have 4+ tabs open on my iPad that I can't close until I've tried out said recipe. My OCD brain hates when I do this. Hates opening up my internet browser only to have all these websites already staring at me as if they were saying, "What are you waiting for?? Pay attention to MEEEEEEE!" It wishes that I would find some other creative way to remind myself to "try THIS recipe" stat. It's so annoying. But I do it anyway. That being said, I'm so happy to be able to finally close one little tab. Ahhhh success, friends. It feels sooooo goooooood. One down, seventy five to go...Just kidding. I'd totally make the recipe again as is, but for this past Father's Day I wanted to see how the bars would hold up without a solid juicy fruit in the filling. Plus my dad and my FIL love lemon, so it seemed like a win-win! I doubled the shortbread crust and topping (because more butter and sugar is always a win) so that the bars would have a little more structure and foundation, changed the sour cream to protein filled plain Greek yogurt, and subbed Averie's delicious pineapple idea for fresh (please use fresh) lemons. 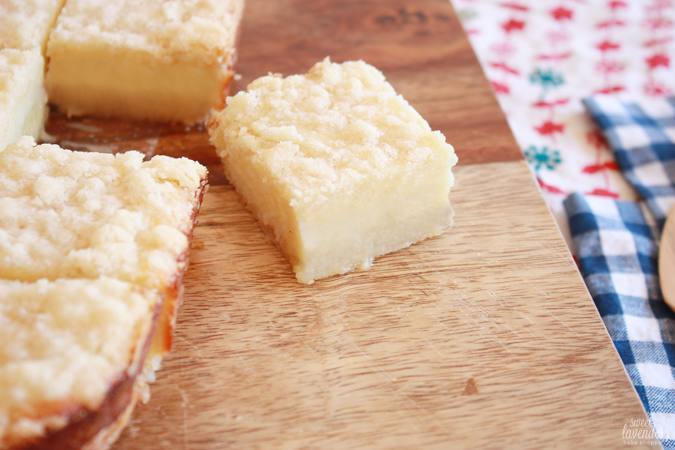 These lemon shortbread bars are buttery to the max, slightly crunchy on the outside and lightly custard-like and chewy in the center. These bars don't give you that tart pucker up taste like traditional curd filled lemon bars do, but rather a nice swirl of lemon favor and essence throughout. Perfect for any lemon lover- big or small. Those pre-teenies are so cute. 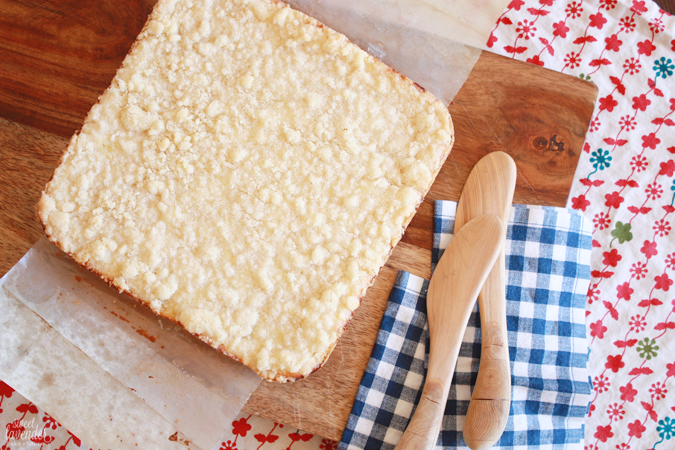 I asked them what I should name these bars and they said...ahem, "Lemon Sugar Cookie Bars" and "Delicious Bars!" My kind of girls. 1. Preheat oven to 350°F and place racks in the middle of the oven. Lightly grease an 8x8" baking dish and then line a strip of parchment across pan so that it covers the entire bottom and goes up two of the sides, with a little overhang. You'll need these flaps on the sides to help remove the bars for cutting. Lightly grease pan and parchment again. Set aside. 1. In a large bowl add your butter, flour, sugar and salt. With a pastry cutter, fork or very cold hands, work the butter into the flour and sugar until a sandy mixture forms with pea sized bits throughout. Kind of like if you were making a pie crust. 2. Sprinkle half of the mixture into your prepared pan and press gently into the bottom and corners to form a crust. I just used my fingers for this. You could also use a spatula or bottom of a glass. Make sure to really get into those corners. Reserve the second half of the dough for the top crust. 3. Place pan in the oven and bake for 12 minutes, turning pan half way through baking time. When done, remove and set aside. 1. In another bowl, whisk together your egg and sugar until fully combined. 2. Next, add the Greek yogurt, lemon juice, lemon zest and vanilla extract. Whisk together until completely mixed. 3. Lastly, add the 1/4 cup of all purpose flour and beat until just mixed and no lumps remain. 4. Pour mixture over your pre baked crust and spread out so that it completely covers bottom and gets into the corners. 5. Finally, sprinkle the remaining half of shortbread crust over the top, making sure to cover entire surface evenly. 6. Bake entire thing in the center of your oven for 35-38 minutes or until sides and bottom are a light amber brown color and top and middle are set. Make sure to turn pan half way through baking to ensure even browning. Remove bars from oven and allow to cool to the touch before removing. Simply run a sharp knife around the two sides of the pan that did not have parchment, lift bars with parchment overhang, and place on a cutting board. Using a sharp large knife, make slices through entire width according to how many bars you want. 4 slices by 3 slices will make 12 total and 4 slices by 4 slices will make 16 bars total. We found that the smaller bars (16 bars per pan) were perfect for a serving. Bars will store covered and at room temperature for up to 24 hours or covered in the fridge for up to 5 days! 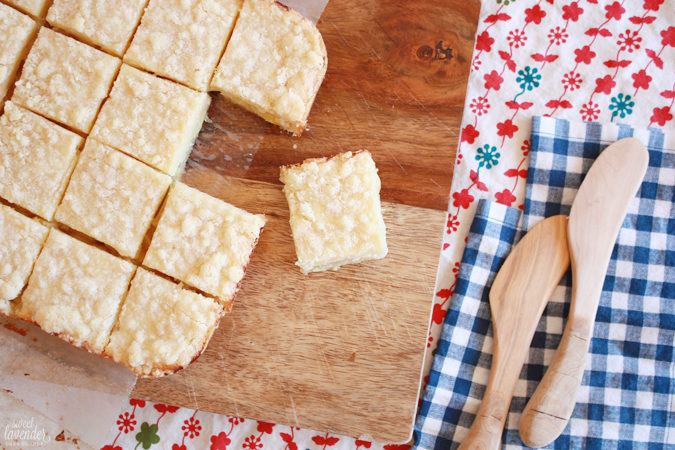 Hey buttery lemon shortbreads bars. How you doin'? Linking up this post with Jack of All Trades. Wowza! These looks so good! My mom loves lemon so she would love these! I'll have to give these a try! These look amazing! I've been super into lemon desserts lately, so I'll have to try these out! Yum!!! Going to have to try these. They look delicious! Oh man I so hope you do! You and me both, girl! You and me both!! My dad and FIL love lemon like it's going out of style. So I can attest to lemon lovers loving these! Hope she digs them as much as they did. I LOVE lemon. all lemon desserts! Those look so yummy! I'm a lemon-lover so I will definitely have to try these! These look so delicious. I definitely have to try this recipe. Thank you! So buttery in texture and ridiculously addicting! Okay, I TOTALLY do the tab thing! All my open tabs are things I need to get to/want to remember. Anyway, this looks delish! Raeca loves lemon so I might just have to try this for her.